Baby’s Size: I appreciated Pregnant Chicken’s Week 38 blog post where she explains that all the pregnancy ‘what to expect’ this week things try to compare baby girl to a vegetable/fruit/etc. But the most accurate size comparison is to an actual baby, because she is pretty much fully the size of a baby now! I have a sonogram on Friday (my first in about 18 weeks!) so I’m hopeful to know more accurately how big my little girl is in particular and just some reassurance that she is doing a-ok in there. Baby’s Progress: More temperature regulation, brain and lung development are the name of the game for the next few weeks. She also has shifted down, which means she is getting prepped to make her entrance into the world sometime soon! Weight Gain: I gained another pound this week, so I think all in all I am on track to gain 25 lbs in this pregnancy, which for someone my height and weight is exactly what I should have done. Although it is kind of entertaining to me how many people comment on a pregnant woman’s size. I was prepared for these comments since all the pregnancy blogs/books/etc warn of them; but it is amazing to me how often it happens! I had one woman at church who commented about how much I was waddling. She obviously doesn’t remember what it was like to have a child’s head sitting on your pubic bone. Sleep: So the good news is I’ve gotten quite a bit more sleep this week, but since this was the place last week I told you about my dog’s sock eating escapades, I’ll do that update here… apparently she decided to up her game and over the weekend chose to eat the armrest cover to a blue suede couch that I have upstairs. The whole armrest cover. So even though she had 5 days of feeling much better after her sock eating fiasco, on Sunday afternoon she took a fairly dramatic turn for the worse and started vomiting and generally looking miserable. So first thing yesterday I took her to the vet, they did X-Rays and decided she needed surgery. Which ended up being a good decision because the elastic was joining two large pieces of fabric and she was pretty miserable. So she is now recovering from surgery at the Vet’s office and I am researching ways to prevent dogs from eating things they shouldn’t. So far it has led me to purchase another dog crate. Milestones: Yesterday we went to the funeral service of one of my childhood heroes. He was an older member of the first church where my dad was the pastor. He and his wife were pillars of the community, leaders in the church, and all around wonderful people. He was a small town Texas banker, a WWII pilot and had more personality than most people could dream of. And he would have loved his funeral service. It was perfect: a bit irreverent, entertaining, full of good old stories, and shared the gospel a little in between. Ralph would have loved it. And it was pretty powerful for me to be sitting on the same church pews that I sat on every Sunday of several years of my childhood listening to my dad preach while I am so close to welcoming my little girl into the world. It made me think about what life would look like in another 25 years and who the childhood heroes would be for Baby Girl. I hope hers are as good as mine were. It was sad to say goodbye to Ralph, but great to be able to be a part of the celebration of his life. Favorite clothing item of the week: Gap T-shirts. I live in these things these days. They are so comfy and easy to toss on in the morning. 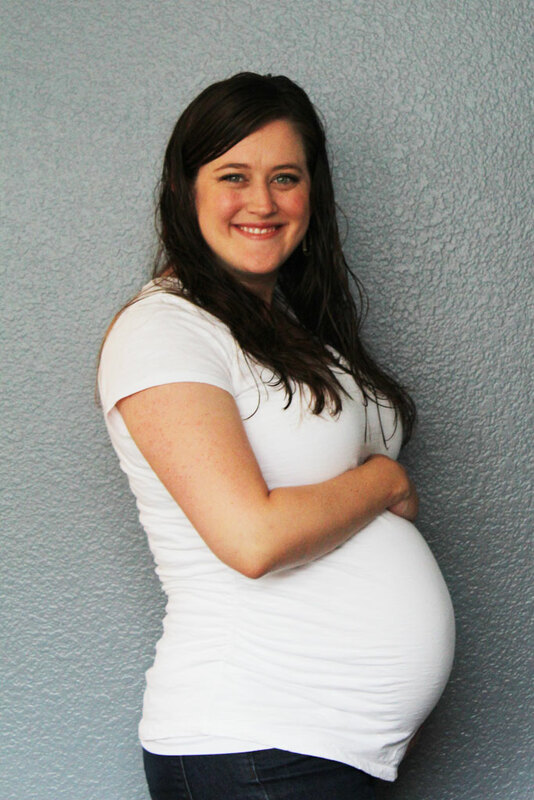 I hope their announcement that they are closing a bunch of stores doesn’t interfere with their maternity line, because I’m not sure I could have survived dressing for this pregnancy without these gap T-shirts… I own them in about 5 or 6 colors, and duplicates of a few! Especially if you can time it right and use a 30 or 40% off coupon, making them somewhere around 12$. That’s cheaper than Target t-shirts!! Workout: I have walked and swam quite a bit this week, and plan to continue that for the next two(!) weeks, although this week with Reese being out of town, I’m trying to take it easier and spend a lot of time with my feet up, since all the books tell me that long walks are a great way to induce labor. My parents came down to spend the week with me, so I’m in good hands, but I’d still rather she wait until AFTER Reese gets home to make his appearance! It is crazy to me that within the next 3 weeks Baby Girl will be here (my doc says she will only let her go a week past due date so I feel fairly confident in this guesstimate). People keep asking if we are ready, and I think the answer is as ready as anyone can be. Her things are all washed and put away, her room is ready, Reese and I have done a lot of reading and talking to friends about caring for a child, but I’m not sure you can actually BE mentally ready for your first child. I think its more of a hold on for a wild ride kind of thing… but we are excited to be so close to getting on the ride! We are here if you need anything! You are a wonderful human being, and are going to be an amazing mother!